Zeeland is largely located at or below sea level. In 1953, the dikes were bad and low. The risk of flooding was once in 80 years back then. Thanks to the storm surge barrier, that chance is now less than once every 4,000 years. Deltapark Neeltje Jans offers you the unique opportunity to visit this building from the inside as well as outside; concrete with a 200-year guarantee surrounds you, steel doors 45 metres wide lift up and the tide rushes under you. You have to see and experience this for yourself! The Storm Surge Barrier is closed by means of a hydraulic system. From the length of the hydraulic cylinders above the barrier, you can see how high the slide is at that place, as well as how deep the water is. The pattern of the tubes shows a mirror image of the flow channels. The operation is centralised in the control room in the J. W. Topshuis. Based on the expected water level, it is determined here whether the barrier remains open or closed. The closing level is legally set at 3.00 metres above N.A.P. The height of the water level is expressed in terms of the number of metres above or below N.A.P. N.A.P. stands for Normal Amsterdam Level (Normaal Amsterdams Peil) and is the level of the average water level of the IJ in Amsterdam around 1680, when it was still in open connection with the North Sea. Now the N.A.P. corresponds to the average sea level. So in 300 years, both land and sea levels have gone up! The N.A.P. gauge is located below the Dam in Amsterdam. If the expected water level reaches or exceeds 3.00 metres, the Rijkswaterstaat closure team decides to close the barrier. The buckle will then be activated at the push of a button. If no one can be present to decide and press the button, the Emergency Closure System will do its job. In this case, the computer will start closing as soon as the water level reaches 3.00 metres. From its implementation in 1986, the barrier has been closed a total of 27 times because the expected water level reached or exceeded 3.00 metres above N.A.P. The construction of the Storm Surge Barrier begins in 1979. A total of 65 pillars, with 62 slides added in between, are placed in the trenches Hammen, Schaar and Roompot. In the context of the earlier plans, the shallow parts in the Oosterschelde estuary had already been raised into islands. The island of Neeltje Jans is now being set up as a working island, from which the operation is undertaken. The prefabricated elements are also built here: the pillars, the upper beams and the foundation mats. Neeltje Jans also serves as a storage place for the stones, which are later deposited around the pillars. A number of working vessels are designed and built specifically for the construction of this barrier: the Ostrea, the Macoma, the Mytilus and the Cardium. The pillars are built on the dry-ground construction docks on Neeltje Jans. As soon as the last pillar is finished, the dike is stabbed and the pillars are in about 15 metres of deep water. The lifting vessel, Ostrea, picks up a pillar, transports it to its position in the barrier and places it, together with the Macoma, with centimetre-specificity, on the foundation. The Macoma also ensures that there is no sand between the foot of the pillar and the foundation mat. After the pillars are placed, they are embedded in an underwater threshold of a landfill. In the end, about five million tonnes of landfills have been processed, which are transported and stored on Neeltje Jans over a period of four years. In the original design of the Storm Surge Barrier, 63 slides and 66 pillars were planned. Because of the higher costs of construction, the 63rd slide was cut out. However, pillar 66 was built and was called the Universally Applicable Pillar (Universeel Inzetbare Pijler, U.I.P.). If anything were to go wrong with one of the other pillars during transport or installation, the U.I.P. was available as a reserve. But everything was going perfectly, and the U.I.P. was never moved. Now it’s acting as a climbing object. The Storm Surge Barrier is built in strong flowing water. Therefore, a good foundation is very important. The barrier must not, of course, sink or shift! The Mytilus is equipped with large vibrating needles. One of these needles can be seen in the outer exposition of Deltapark Neeltje Jans. The vibrating needles cause a thickening of the sand layer, which makes it stronger. Two foundation mats under each pillar are there to ensure maximum stability. The mats are produced at the mat factory on Neeltje Jans. The Cardium slowly rolls the foundation mats over the bottom. 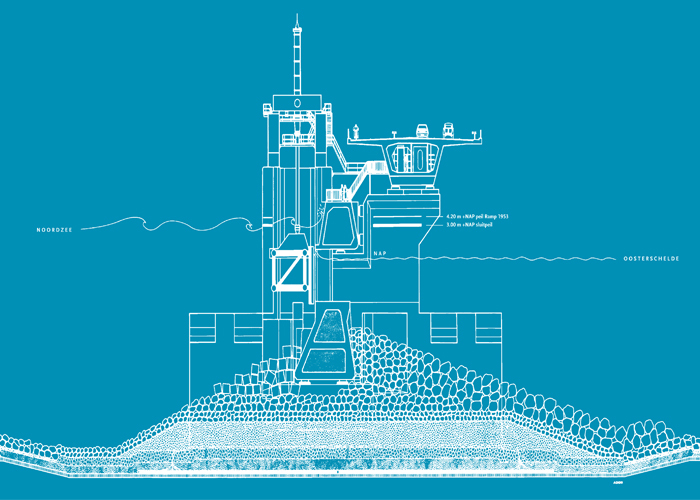 More information about the construction of the Oosterschelde barrier can be seen in the film Delta Finale. This film can be seen continuously in one of the main building’s movie halls. The 62 slides are made of steel, and almost 42 metres long. The height varies according to the depth of the current hole on the spot; from 6 metres to almost 12 metres. The motion mechanism is a hydraulic system. Each slide is moved by two hydraulic cylinders. The system is operated from the J. W. Topshuis. After the application of the underwater threshold, the superstructure of the barrier is then completed. First, the traffic chocks are fitted; tube-shaped beams carrying the road over the barrier and housing the movement equipment. This is followed by the pillar hubs, which raises the pillars to that which the slides are attached to. Followed by the upper beam, which is placed on top of the underwater threshold. Finally, the upper beams form the upper limit of the openings through which the water flows and which can be closed with the slides.